The preeminent authority in steel shot reloading technology! Additional Sizes – Tolerances – Materials as you may require…phone R.S.I. for all your commercial steel requirements. Any application where lead shot was previously used and now requires a non-toxic substitute ball. Radically Enhanced Density E-Shot vs Regular Steel E-Shot requires 495 F.P.S. velocity for penetration. Normal 7.8 Steel requires 575 F.P.S for penetration as illustrated in the R.S.I Handbook. NOTE – Regular Steel has high enough velocity up to 55 yards. E-Shot has high enough velocity up to 100 yards. Special patented design: conical vaning, focal points and flexible base give “SAM 1” Wads their special ballistic nature. Regardless of what you’ve heard about steel. 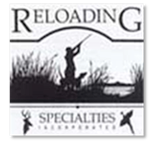 Reloading Specialties Inc. has an effective economical option that will make you a believer in reloading steel versus buying factory steel shells. 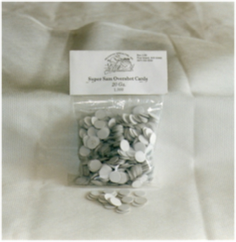 Overshot Cards are intended for use OVER steel for a slight steel to crimp level adjustment. .625 dia./Qty. 500 Will work in 20ga, 12ga and 10 gauge shells. 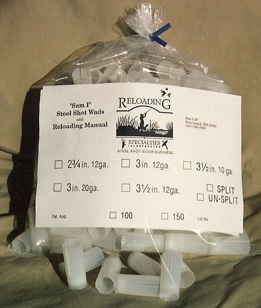 An instructional reference that simplifies reloading, shooting and hunting with steel shot. (Includes the newest advanced recipes for 20ga. 3”,12ga, 2¾”, 3”, 3½, and 10ga 3½.) Using the “SAM 1” wad, you will be able to reload the worlds fastest steel shot shells. A significant new inclusion in this handbook is the announcement of Alliant’s new propellant “STEEL” (the worlds first and only canister propellant designed specifically for steel shot reloading). R.S.I. will be featuring 57+ new recipes using Alliant “STEEL” powder which will propel equal or larger payloads at higher velocities all at lower more consistent pressures. New in the handbook will be 15 recipes using bismuth with Sam 1 wads, at high velocity and low pressure. 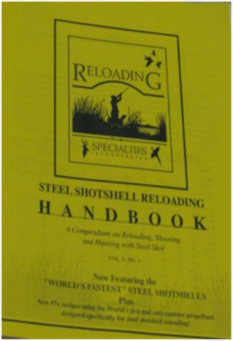 There are extra pages on what is new and hints on reloading steel. 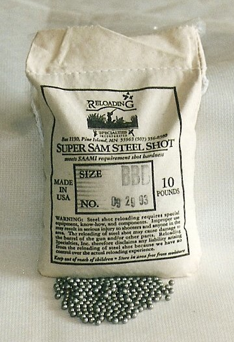 R.S.I has always had the world’s fastest steel shotshells and now they will be even faster! Also includes information from various experts on ballistics and the art and technology of gunning with steel. Everyone who uses steel will want one! May be used under, under and over, or just over the shot for minimum to maximum steel to crimp level adjustment. Allows all “SAM 1” wads to use various payloads with ease. 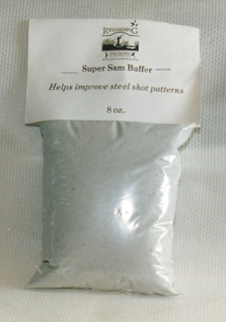 Granulated plastomers assist patterns and a better buffer makes better patterns. 8 oz. 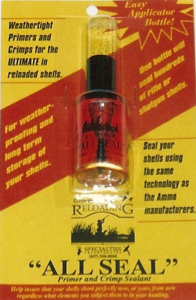 Primer and crimp sealant, for weatherproofing and long term storage of shells, seal your reloads like the ammo manufacturers do. One bottle will seal hundreds of rifle or shotgun shells. ½ fluid oz. The ballistics data is conclusive at these high velocities, steel will achieve virtual lead performance. Anyone that has ever complained about steel, will again think of this fall as the “Good Old Days”. Pattern Integrity – Okay now we achieved ultra-high velocity in steel shells. How about the pattern? Would it blow open at such high velocities? After the last month of some pretty extensive pattern analysis and anxious waiting, the results are in. It seems unbelievable but at increased velocity, pattern integrity tended, in almost every scenario, to improve. There seems to be a velocity window, per each payload and shot size, that, with the SAM 1 wad, enables us to achieve unheard of patterns. We are setting the standards for excellence in steel shell shot reloading. In the past and in the present, innovations insure our claim that Reloading Specialties, Inc. is the preeminent authority in steel shot reloading. Our list of wholesalers is too long for inclusion in this website. 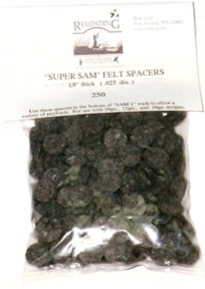 Please phone Reloading Specialties for information where to locate our products near you. New wholesalers welcome.